My billing address is different than my shipping address above. You must enter the address where you receive your credit card statement, exactly as listed on your statement. Reader feedback is important to us. May a member of our Editorial Research team contact you via email? 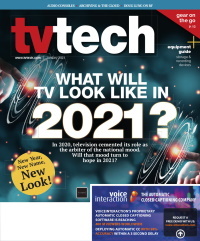 The TV Technology editorial team wraps up technology, regulatory and television business news and developments twice each week. The iconic Broadcast Engineering brand finds a new home under the TV Technology umbrella with this weekly newsletter, edited by former BE contributor Michael Grotticelli. A compendium of deep tech discussions, applied technology reports, reviews, and tech updates, the newsletter is geared for TV and Pro Video engineering leaders charged with evaluating, selecting, and implementing next generation solutions.